Tuesday’s debate and vote in the U.S. Senate on whether to end (technically whether or not to vote on whether to end) U.S. participation in the war on Yemen can certainly be presented as a step forward. While 55 U.S. Senators voted to keep the war rolling along, 44 voted not to table the resolution to end it. Of those 44, some, including “leaders” like Senator Chuck Schumer, said not a word in the debate and only voted the right way once the wrong way had won. And conceivably some could say they were voting in favor of having a vote, upon which they would have voted for more war. But it’s safe to say that at least most of the 44 were voting to end a war — and many of them explicitly said so. I use the phrase “end a war,” despite the fact that Saudi Arabia could continue its war without U.S. participation — in part, because it’s easier, and in part because experts have suggested that Saudi Arabia could not do anything like what it is doing without the participation of the U.S. military in identifying targets and refueling planes. It is of course also true that were the United States to go beyond what was under consideration on Tuesday and cease providing Saudi Arabia with planes and bombs, and use its influence as an oil customer and general war partner to pressure Saudi Arabia to end the war and lift the blockade, the war might end entirely. And millions of human lives might be spared. “Stumbled into”? Forget it, he’s rolling. And Kaine was the least of it. To watch Dianne Feinstein argue for ending a war had a very Twilight Zone aspect to it. Look through the list of who voted “Nay” and re-define them in your mind as people who under just the right conditions (possibly including guaranteed failure to reach a majority) will sometimes vote to end a war. I’d call that progress. But if you watch the debate via C-Span, the top question in your mind might not be “What incredible activism, information, accident, or luck got 44 people to vote the right way?” but rather “Why did 55 cheerful, well-fed, safe people in suits just vote for mass-murder?” Why did they? Why did they take a break for political party meetings in the middle of the debate, and debate other legislation just before and after this resolution, and walk around and chat with each other exactly as if all were normal, while voting for genocide? Senator Jeff Merkley asked if partnering with a government trying to starve millions of people to death squared with the principles of the United States of America. I tweeted a response: “Should I tell him or wait and let his colleagues do it?” In the end, 55 of his colleagues answered his question as well as any history book could have done. The ridiculousness of arguments for continuing the war was called out by senators on the floor. 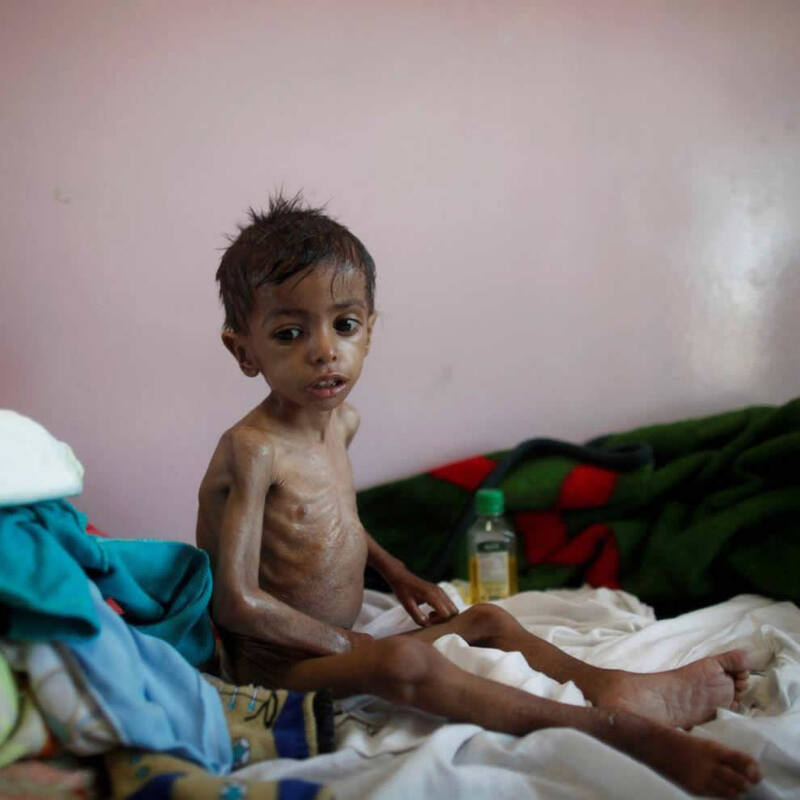 Senator Mitch McConnell and others made the claim made to them by Secretary of War (“Defense”) James Mattis, that ending U.S. participation in bombing civilians in Yemen would mean more civilian deaths in Yemen, not fewer. Others trotted out the claim made by Trump’s lawyers, parroting Obama’s lawyer Harold Koh, that bombing a nation flat is neither “war” nor “hostilities” if U.S. troops are not on the ground being shot. Senator Bernie Sanders put a stop to such nonsense. He recommended trying telling the people of Yemen being bombed with U.S. bombs and U.S. targeting and U.S.-fueled planes that the United States is not really involved. The idea that the full Senate should leave to a committee a matter the committee had not bother to touch in years was also appropriately laughed out of court. To their credit, Senators Murphy and Lee and Sanders were very clear that a vote to table, rather than directly vote on, their resolution to end the war, would be a cowardly vote not to have a debate and not to obey the U.S. Constitution. And to their greater credit, they went ahead and had the substantive debate prior to the vote to table. In the past on at least one occasion of the many times that we’ve seen such resolutions brought forward in the House, the war-proponents talked substance while the opponents talked only procedure. This change, too, was progress. So, why? Why did the Senate vote for genocide? And why is nobody surprised by it? Well, the arguments made by the Senators on the right side of the debate certainly left something to be desired. Sanders spoke of the dead in the wars on Vietnam and Iraq, and they were all Americans. He said the war on Vietnam almost destroyed an entire generation of Americans. This was a war that killed 6 million people in Vietnam, Laos, and Cambodia, plus 50,000 from the United States. How can people come to think about one-sided slaughters if we pretend they don’t really exist? Senator Tom Udall said that from WWII until the presidency of Donald Trump the United States was a noble, law-abiding, altruistic leader of spreading democracy, although not quite perfectly. In so saying, Udall bestows on Trump a sort of magical power, as well as rewriting U.S. history. The U.S. public was allowed no vote on Tuesday. Neither was Trump. The resolution itself was limited, marred by loopholes, and not truly whipped for by many of those who voted against tabling it. Perhaps a stronger resolution would have failed even more badly. Or perhaps a more coherent case against war would have been more persuasive. I do not know. But the notion that you should arm and assist the Saudi dictatorship in bombing people when it’s called anti-ISIS and not when it’s called anti-Houthi seems a trickier case to make than the one that you should stop arming and assisting in the slaughter of human beings, generating more enemies, impoverishing the public, draining funds from human needs, damaging the environment, eroding the rule of law, imperializing the presidency, militarizing your culture and schools and police, and aligning your government with a brutal monarchy. Perhaps that’s a case that has to be made to the public first and then to the senators, but many senators made clear how they were thinking. Lee was not off in trying to reassure them about the setting of precedents. One of them openly worried that if refueling bombers that were blowing up people’s homes in one country was counted as “hostilities,” then refueling bombers that were blowing up people’s homes in any country could be counted as “hostilities.” And then what kind of a world would we have?! So, a vote against one war is never just a vote against one war. It’s a vote to challenge, if ever so slightly, the power of the war machine. These Senators are paid not to do that. Obviously one must look at numerous votes and other actions, and at bribes from previous years, and at the relative cost of running in each state, etc., but we do see here 51 of the 55 yes votes receiving weapons profits, and most of them near the top or middle of this list. And we see 42 of 44 no votes receiving weapons profits, and most of them near the middle or bottom of this list. Of the top 70 recipients, 43 voted yes. Of the bottom 20 recipients, 14 voted no. A bigger factor would seem to be political party, since 45 of the 55 yes votes were Republican (plus 10 Democrats), and 37 of the 44 no votes were Democratic (plus 2 Independents and 5 Republicans). But this can hardly be separated from funding, as the amounts above are dwarfed by the money brought in and distributed to candidates by parties, with the “defense” profiteers giving the Republican party $1.2 million, and the Democratic Party $0.82 million. One can be very confident that neither party’s “leadership” privately asked its members to vote to end the war on Yemen. Publicly, the Republican party leadership urged a vote for continued genocide. If we look at party and money combined, we see that all of the Republicans who voted no are pretty low in the list, while the relevance of bribes is less clear with Democrats who voted yes. But a no vote as part of a majority — had such a thing happened — would have been unlikely to have pleased either party. Then there’s the media problem. The Democratic Party-promoting MSNBC was silent, while NPR told its listeners that poor innocent Saudi Arabia was surrounded and under attack by the demonic Iran. The New York Times editorial board did better than its reporters. But if any coverage of the U.S. role in Yemen had made it onto television, then I would be able to find people when I travel around the United States who are aware that there is a war in Yemen. As it is, I can find few who can name any current U.S. wars. If Senator Sanders had opposed this war when he was running for president, instead of urging Saudi Arabia to spend more and get its blood-soaked hands dirty, progressives would have heard that — and I would have backed Sanders for president. Or what if Amnesty International, Human Rights Watch, ACLU and other groups claiming to support human rights had helped oppose the war on Yemen? Or what if pundits stopped referring to such groups as human rights groups and called them, instead, Pro-U.S.-War/Human Rights groups? Would that have made a difference? What about the rest of us? I work for two groups that tried: RootsAction.org and World Beyond War. So did many others. Many formed big coalitions to try to have a bigger impact. Could we have done more? Of course. What about people who didn’t sign anything, go to anything, phone or email any Senators? It’s hard to say that any of us have clean hands. I happened to read a column on Wednesday that proposed that everyone cease honoring any former U.S. president who owned people as slaves. I’m all for it. But the same column proposed as a noble and honorable factor being a decorated and “successful” (German) soldier. This gives me pause in denouncing slave-owners as “monsters.” Of course slavery is monstrous and those who do it are responsible for it. Their statues should all come down and be replaced by worthy ones, including ones of slavery-abolitionists and civil-rights activists, ideally memorials for movements rather than individuals. But what if we come someday to understand that war is monstrous? Then what should we make of war supporters, including columnists? And what am I to make of things I myself thought a decade or three ago and now no longer think? Isn’t there something a shade monstrous about praising war on the anniversary of the 2003 attack on Iraq and at the same moment that the U.S. Senate is voting to kill the (non-“white”) people of Yemen? And yet, isn’t such behavior found in a column opposing racism, written by an anti-racism activist the work of something other than a monster? Perhaps senators aren’t monsters either. Perhaps we can bring them around yet. We have to try.